Technology: Reaction Injection Molding Services are plastics molding services which use injection molding techniques with thermosetting polymers, which produce a curing reaction within the mold. This differs from ordinary injection molding where the material hardens through cooling. 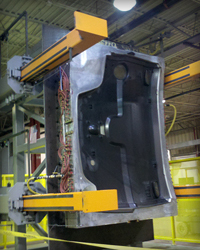 The RIM molding process is used to make heavy duty molded body and interior panels for tractors, trucks, etc. Variations of the process include Reinforced RIM and Structural RIM, which add various reinforcing materials in the molding process to add strength to the thermosetting resin. Applications: Reaction injection molding services are useful for molding large parts requiring good structural strength.